The following organizations have graciously volunteered to help sponsor the 10th Annual Gene Convention. If you are interested in being a sponsor of this event as well, please contact Sandra Stillwell. FDQ is donating a special convention issue for us, and advertising helps defray costs of production. A full-page color ad is $500; a half-page ad is $250; and a quarter-page is $125. There is a 10% discount for booking ads as part of a multi-convention package that includes GAW, IFDC, Gene and the Jason Wu event. All full-page advertisers will receive 100 free copies of the issue to sell in their stores. If you would like to advertise in the special Convention Issue of FDQ, please send Pat Henry an e-mail for specs on size and file requirements. You can upload ads to her domain, or send them on disk to FDQ. The deadline for ads for those who need design help is September 1, and September 10 for camera-ready ads. The Doll Peddlar is honored to be a first-time sponsor, especially for the very special 10th Annual Gene Convention. We've enjoyed attending several past conventions and greatly look forward to November. Sandra has put together another over-the-top event for all of us this year. We have a full-service store in Little Rock, Arkansas. Ever seen Mel in an Arkansas Razorback "Hog Hat"? Be sure and pick up a copy from us at convention. We work on our website daily to keep it current with an extensive array of new and retired dolls, fashions, accessories, stuffed animals—more that 6,000 items. Click here to visit our site. We are delighted to have been a sponsor of the Gene Convention for a number of years now, in addition to attending six of them. We will be celebrating our 17th year in business in August thanks to the continued support of our very loyal customer base. Without them we would not have been able to sponsor the Gene Convention. It has been such fun to have Mel Odom as our guest and to have over 100 fans come to our store to pay tribute to the man who started this wonderful world of play for all of us. Thanks, Mel, for allowing us to experience so much pleasure, and Sandra for keeping it alive. Click here to visit our website. Gigi's Dolls & Sherry's Teddy Bears is celebrating its 24th year. Yes, it is hard to believe—many changes have taken place—and many fabulous dolls have come forth in that time such as Gene, Madra, Trent and Violet with their beautiful wardrobes and separates. We find having a variety such as antique, collectible, composition, hard plastic and modern dolls pleases both us and the collectors. Doll collecting brings happiness to numerous women, men and children. Our shop has 5,000 sq. ft. for our customers to leisurely look at and enjoy not only dolls but plush and doll houses and miniatures. We take credit cards and layaways. Click here to visit our website. Manufacturer of the Gene Marshall Collection, the Ashton-Drake Galleries is headquartered in Niles, Illinois, near Chicago. 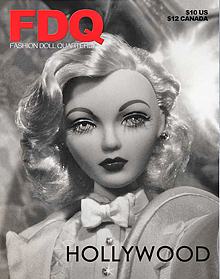 Founded in 1985 as part of the Bradford Group of collectible companies, it has grown to become the world's largest direct marketer of limited edition dolls. From the very beginning, Ashton-Drake has produced award-winning dolls, and has been committed to giving value and quality to its customers. Click to visit The Official Gene Marshall Collection Web Site. Designer of this year's exclusive convention doll, George Sarofeen has numerous Monolitic Studios credits which include designs for Gene: Will You Marry Me?, Friendly Connection, Shimmering Star, Champagne Flight, Presidential Ball (DOTY Award 2002), and Mardi Gras Magic; Madra: Anything But Nice, Dark Desire, and Like a Fox; and Trent's Royal Military. This is Brian Bulkley's third year as convention art director. An illustrator for nearly 30 years, most of his experience has been with retailers such as Pittsburgh, PA-based Joseph Horne Co. and Nordstrom. He has also done commissioned pet portraits and contributed illustrations for FDQ magazine, as well as doing the graphic design for the packaging and story cards for Fashion Boulevard and the Christina St. Clair and Felice La Rouche dolls. Click here to contact Brian via e-mail.